You can view the status of scans in progress, find information about failed scans, and view other scan-related data on any collection page, in the Scan Status window, and in the Computer window on the Scans page. 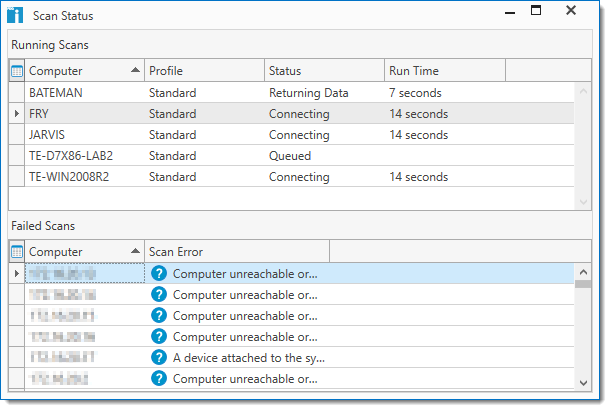 When scans fail, PDQ Inventory helps you diagnose the problem by providing a reason for the failure and a link to the failed scan More Info window. For details, see More Info: Failed Scans. 1.On the Main Console window, select the All Computers page in the tree, or open a collection page. 2.Scroll or expand the window to see additional columns on the collection page grid. •Scan in progress: Real-time status as the computer is scanned, including: Queued, Connecting, Running, the individual scanner names from the selected scan profile, Returning Data, and Saving. •Successful: If the most recent scan of this computer succeeded, this field is empty. •More Info: If the most recent scan of this computer had an error, this field lists a More Info link and the primary cause of the error. To view additional information and support links about scan errors, click More Info or select the computer, then right-click and select Diagnose Scan Error. •Aborted: If the scan was canceled by the user, the field displays Aborted. •(Offline Settings): A computer is offline at the time of the scan and the offline settings are invoked (as defined in Preferences > Scanning, Offline Settings). •(Waiting for Agent): The Agent is unavailable and the scan is pending. The scan will be started when the Agent is available (for more information, see Agent). The date of the last successful scan of this computer. Whether or not the computer has ever been scanned. Yes means it has never been scanned, and No means is has been scanned. Details about the specific error that resulted in the scan error (typically the same information available on the More Info link under Scan Status errors). The user credentials used to perform the scan. 3. (Optional) To stop a running scan, select the computer currently running the scan, then click Computer > Abort Scan (or right-click and select Abort Scan). 1.On the Main Console window, open All Computers, or a collection page. 2.Select a computer, then click Computer > View Computer Details (or press Ctrl+O or double-click it). The Computer window opens for the selected computer. The unique scan ID number as assigned by PDQ Inventory. The date and time that the scan was attempted. The name of the scan profile. 4. (Optional) To stop a running scan, click File > Abort Scan . 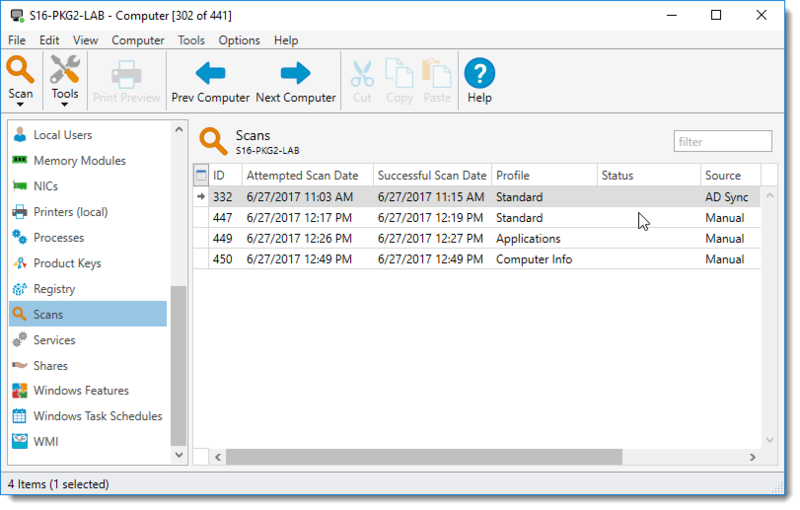 The Scan Status window shows running scans and the last failed scan for all computers in your database. 1.On the Main Console window, click View > Scan Status (or press Alt+S). The Scan Status window opens. The name of the computer being scanned. The name of the scan profile used to scan this computer. Real-time status as the computer is scanned, including: Queued, Connecting, Running, the individual scanners names from the selected scan profile, Returning Data, and Saving. How long the scan has run. The name of the computer. The primary cause of the failure and a link for More Info. To view additional information and support links about the failed scan, click More Info. 2. (Optional) To stop a running scan, select it, then right-click and select Abort Scan. 3. (Optional) Double-click any computer in the Failed Scans list to open its Computer window.